The fossil La Chappelle-aux-Saints is represented by a nearly complete edentulous cranium and mandible. 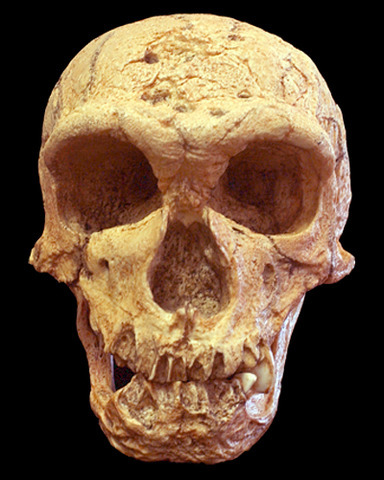 The adult male cranium displays many "classic" Neanderthal traits, including a large, continuous brow ridge; a broad nasal aperture; a long and egg-shaped foramen magnum; a relatively flat cranial base (vs. modern humans); small mastoid processes; a long and low cranium; and large orbits3,4. There is also clear evidence of pathologies in the postcrania1. The fossil is often referred to as an "old man" because he was suffering from severe periodontal disease and joint degeneration or arthritis3. The periodontal disease was so advanced that almost all of his teeth were lost antemortem (notice the degree of alveolar bone resorption). Evidence for arthritis or joint degeneration is present on the mandible1,3. The ability of this individual to survive such severe ailments indicates that he probably had help from others. Cave AJE and Straus Jr WL. 1957. Pathology and posture of Neanderthal man. Quart. Rev. Biol. 32:348-363. Klein RG. 2009. The Human Career: Human Biological and Cultural Origins. Chicago: The University of Chicago Press. Schwartz JH and Tattersall I. 2002. The Human Fossil Record (Volume One): Terminology and Craniodental Morphology of Genus Homo (Europe). Hoboken: Wiley-Liss.